Cartographica is full of features to make it easy for you to explore, analyze and present your geospatial data. Here is just a sample of the facilities available in Cartographica. 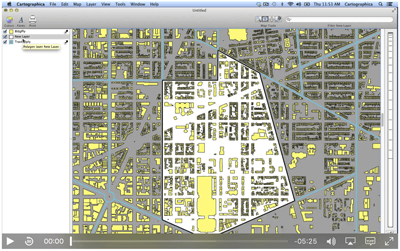 Cartographica has a wide range of data import capabilities, nearly assuring that you can turn your data into maps. Bring in your geo-referenced raster data (like orthophotos and satellite imagery), your vector data from almost any source, or even CSV text files. A more complete list of imported and exported formats is available, including ESRI® File Geodatabase. There's lots of good data available on the Internet. Getting data from a Web Map Server or Web Feature Server into your map document is a snap. Just load up the area you're looking to cover and select the Map Server. Cartographica will do the rest, from matching the coordinate system to testing the boundaries, to warping the graphics if necessary to meet your current CRS. If you don't know where to start, just add a Live Map from Bing™ Maps† or OpenStreetMap with one simple command. This is a Macintosh, and you'd expect fast filtering of data. With Cartographica, you get just that. Using the search box, you can filter on any column. With multi-variable searching and boolean operations you can explore your data even more effectively! Cartographica provides sophisticated print layouts, including the ability to put multiple maps on the same page, overlay scale bars, compasses, and legends, or keep them aside, and add text notations. Even have multiple copies of the same map on a page with different zoom levels, extents, and visible layers. For 1.4, we've added more flexibility and control to Map Layout, including the ability to remove or control borders, and much more control of text formatting and layout. Styles define what layers should look like in a map. Easily put together a simple style based on fill and stroke colors, or create a sophisticated style set for a layer allowing easy identification of features with different attributes. Along with your colors, add labels for features, including data from any column or columns and on multiple lines if necessary. For 1.4, we've made substantial advances in line and polygon styles, adding patterned and multi-stroke lines for both line features and outlines of polygon features. We've also added pattern fill to polygon features, making it possible to show swamps as clumps of grass instead of just a colored area (for example). Need to define geometry for your map without exact coordinates? Cartographica lets you create a new feature, or edit an existing one with ease. Just double-click and move the control points. Styles and related information follow right along. Merge vector features into a single feature–consolidate roads or GPS tracks, join polygons. Cartographica 1.4 enhances these capabilities further, providing snapping tools to constrain shapes to other layers, or match them up to the existing layer. Cartographica helps you to georeference (or edit the georeferencing information for) imagery. Georeferencing can be done with a standard matrix, or by adding or changing Ground Control Points (GCPs). And when you're just starting to georeference an image, you can use our Fit Display button as a first approximation. You can control transparency while you move the image around or warp it into place, so you can see just how things line up. We believe that exploring geospatial data should be risk-free. Why should you have to live with every change you make? Cartographica's ubiquitous undo capabilities means whatever changes you've just made... you can undo them... and then put them back. Look at your data and map at the same time. Zoom in and filter the map and the data view follows. Scroll around and select features in the data set and they are highlighted on the map. Visualize your data your way. Don't want to give up screen space for the data view? That's fine, just drag it shut, and then open it when you need it again. Got addresses? Cartographica is the easiest way to put them in their place. With Bing† Geocoding support and our improved internal Geocoder, you have your choice of easy-to-configure online services, or geocoding using your own data (especially useful if you want to look at historical information). Cartographica will take addresses from lists in text files, tables in databases, or vCards dropped on your map. If you need to load up field data from a variety of GPS devices, go no further than the File menu. Using the GPS import modules tested over the last three years in our free LoadMyTracks software, we can import waypoints, routes, and tracks directly from hundreds of devices, including those from: Garmin®, Magellan®, Lowrance®, Sony®, and others. And, if your device isn't directly supported, it can import the data using GPX files (the standard for GPS information). There's a lot of data available out there, but often each layer is coded with a coordinate reference system that is specific to its producer's own needs. Cartographica understands that, but doesn't let that get in the way of making the data easy to use. Although you can change coordinate systems in existing layers, we'll be just as happy to do the conversions behind the scenes (for raster as well as vector data) in order to make sure your layers match up. And, if we don't have the projection or CRS built-in, you can add it yourself from another map or by importing a CRS in Proj4 or WKT format. Cartographica 1.4 expands substantially on the spatial analysis functions of our GIS. In addition to Kernel Density Analysis, Buffers, Convex Hulls, and other tools that have been available in pervious versions, we have added Cluster (Hot Spot) Analysis, spatial joins, and spatial overlay operations. These powerful tools make it even easier to explore and manipulate data. Use the new polygon update function to swap in new geometry for old. Cartographica can remember where you like to look and take you back there. Do you commonly deal with geospatial data in the same places? Cartographica can bookmark areas and viewpoints (a combination of the area and scale) to take you back to where you want to look regardless of which may you are using. Use these to quickly move to known place on a map, or reposition a Map Layout view. †Access to Bing Maps and geo-coding is available to all customers with an ongoing support contract with ClueTrust.